Abstract: Hinterland haulage among major deep-sea ports and the cargos� original/final inland locations has become an important component in modern logistic systems. Intermodal freight transport integrates the use of different modalities (e.g., trucks, trains, barges, etc.) during the freight delivery process to improve the reliability and efficiency of hinterland haulage. In this paper, we first review existing intermodal container transport planning approaches. Next, a dynamic intermodal transport network model developed by the authors in an earlier work is briefly recapitulated. To deal with the dynamic transport demand and the dynamic traffic conditions in the intermodal transport network, we propose a so-called receding horizon approach to address the intermodal container flow assignment problem between deep-sea terminals and inland terminals in hinterland cargo transport. The proposed approach considers the movement of containers as a flow and makes container flow assignment decisions in a receding horizon fashion during the container transport period. 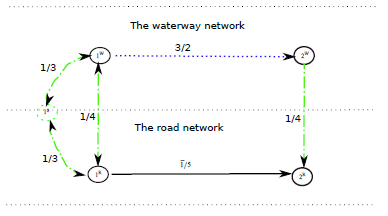 At each time step, the future behavior of the intermodal transport network is predicted using a dynamic intermodal transport network model fed with information on the current and estimated transport demands and traffic conditions, and container flows are assigned over an intermodal transport network with load-dependent freeway transport times by solving a nonlinear optimization problem. Simulation studies for intermodal container flow assignments are conducted by both an all-or-nothing approach and the proposed receding horizon approach. The simulation results illustrate the potential of the proposed approach. Reference: L. Li, R.R. Negenborn, B. De Schutter. A receding horizon approach for container flow assignment in intermodal freight transport. In Proceedings of the Transportation Research Board 93th Annual Meeting (TRB'14), Washington, D.C., January 2014. 14 pages. Paper 14-0088.